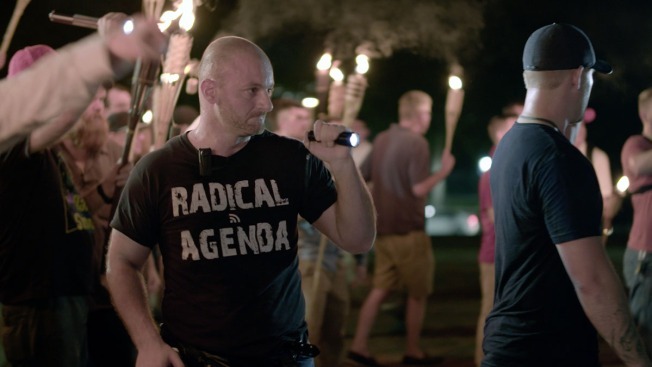 FILE - This Aug. 11, 2017, image made from a video provided by Vice News Tonight, Christopher Cantwell attends a white nationalist rally in Charlottesville, Va.
A white nationalist who was charged in connection with a torch-lit rally at the University of Virginia last year has been arrested for public swearing and intoxication last month. Leesburg police spokesman Sam Shenouda tells WTOP-FM an officer observed 37-year-old Christopher Cantwell of Keene, New Hampshire, stumbling while trying to cross a street and smelled a strong odor of alcohol. Cantwell was arrested March 31 and released on his own recognizance. However, WVIR-TV reports a judge ruled Thursday that Cantwell will be incarcerated until he gets an alcohol bracelet. Cantwell had told The Associated Press he pepper-sprayed a counter-demonstrator in self-defense during the Aug. 11 protest, a day before the larger white nationalist rally. He had been out on a $25,000 bond. It's unclear if he has a lawyer.